Copic colors: E00 and E04 for the brick wall; E15 for the trim, E47 for door shadows; Y35 and Y00 for the windows. Thanks so much for doing these videos! You do such a nice job! It inspired me to finally order this stamp set! I think you deserve the whole cake. I so appreciate your videos and the way you color your houses. And this little girl is cute as a button, I could just eat her up! oh this is absolutely ADORABLE – I love how you colored the bricks with your markers. I never would have thought to do that! While I don’t have Copic’s either…think that I can translate the general ideas on shading and creating the different looks of the house. Thanks for doing the series, inspirational! Left ya some love and liked on U-tube…want to get those numbers up! Sandy I really enjoyed the whole week of tutorials I know they are alot of work for you(not really never done one) but they look like it. Thank you so much for doing them. I am looking forward to the future ones. I have enjoyed all your Little House videos. While I don’t have Copics I do have this stamp set. I’m sure I can use these ideas for inspiration with my other coloring media. Thanks for sharing your beautiful cards with us! Your last several house cards are adorable! They look like fun to make as well. 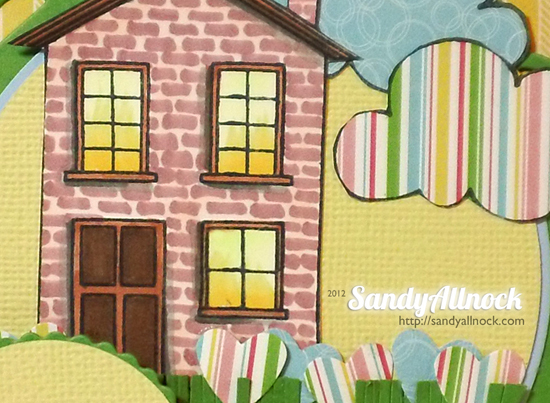 Wonderful card–I love the bricks and the clouds. Definetly my favorite – I love the paper piecing – but especially the hearts for (and) flowers! Inspiring!